The Commission for Energy Regulation has announced that the Public Service Obligation Levy will increase by 40% from 1 October 2017. The Public Service Obligation levy charged to all electricity customers and subsidises renewable energy generation, and peat and biomass power plants. The PSO Levy, which is charged to all electricity customers, is set to increase by 40% from 1 October 2017. The PSO Levy increase will add €32.28 to all domestic electricity bills and will mean that Irish households will have to pay €112.63 per year when VAT is included. This is the second largest increase in the PSO Levy’s history. Why has the PSO Levy increased by so much? The PSO Levy is charged to all electricity customers through their bills. It is used to subsidise renewable energy generation, peat burning power plants, and to a lesser extent, biomass and hydro generation. According to the Commission for Energy Regulation, this year’s increase in the PSO Levy is primarily due to an increase in the level of renewable generation across Ireland. In layman’s terms, we have a whole lot more wind capacity than we did last year, and that now needs to be subsidised to the tune of €296 million. It’s not just renewables though. Peat burning power plants will receive PSO Levy subsidies of €110 million for the 12 months from 1 October. 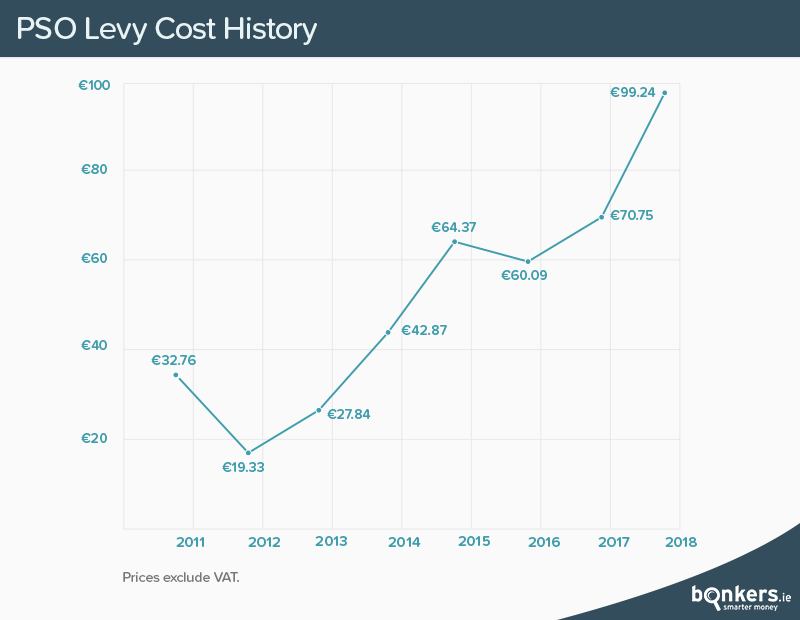 The PSO Levy has increased most years since it was first charged in 2010, and the overall increases correlate closely with the increase in renewable energy generation in Ireland. In 2010, Ireland produced just 12% of its electricity from renewable sources. In 2015, Ireland produced more than 40% of its electricity from renewables with the bulk of that coming from wind generation. Wind generation has made such an impact on the Irish electricity market that on St Patrick’s Day this year, wind generated electricity accounted for 60% of Ireland’s total electricity consumption. This has also had a knock-on effect on Ireland’s need to import fossil fuels, particularly gas. Natural gas was used to produce 64% of Irish electricity back in 2010. By 2015, gas accounted for just 36% of total generation which is an extraordinary shift in such a short space of time, and would not have been possible without the PSO Levy. The PSO Levy is certainly controversial and today’s price increase announcement means that the Levy will now account for 10% of the average household’s electricity bill. And because it’s not consumption based, everyone will have to pay the same amount regardless of how much they use. The PSO Levy is also strongly affected by the price of wholesale electricity. When wholesale prices are high, less money is required to subsidise renewable generation because suppliers receive more money for the electricity that they produce. However, when wholesale prices are low more money is needed to subsidise renewable generators and schemes that are supported by the PSO Levy. The amount of money needed for the PSO Levy did fall slightly in 2011 and again in 2015, but these decreases have been more than offset by subsequent hikes as can be seen below.